What do pretty much all kids eat? Fruit! What do they pretty much all dislike? Vegetables! 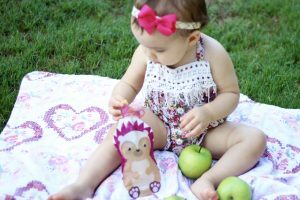 Izzy has loved applesauce since she first had a tiny taste at 4 months old. 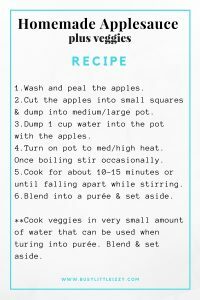 I want to share with you all how I get some veggies mixed into applesauce without Izzy knowing. 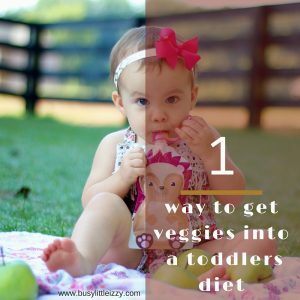 Continue to offer veggies at meal time, but in between sneak veggie vitamins in! Ready for my secret to sneaking in extra veggies? What do you put the applesauce in? 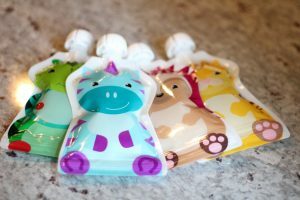 Reusable pouches from ChooMee. They are perfect for little hands that want to eat messy purée. I freeze most packets and put a few in my fridge. ChooMee also makes Sip’n covers. They are soft for little mouths that love to chew and they keep the messy spills down. 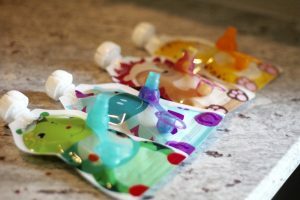 Best part, they are compatible with many pouches if you don’t feel like making your own! Click here and scroll down to see the reusable and disposable brand packets that fit with this cover. I pour applesauce into the packet, about halfway. Then I add a tablespoon of the veggie mix and then add more applesauce until there is 3/4-1 inch left to the top. You will want that room in order to zip the bottom out without spillage. Once the packet is closed shake it up and put it in your freezer or fridge. Remember if you are freezing, do no fill too much so there is room for some expansion. Cheers to healthy snacking in and out of the home. Great idea! 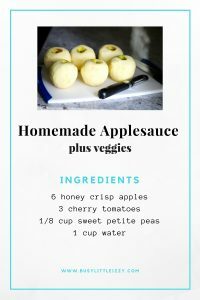 My kids love apple sauce so I’ll just hide some veggies in there! Make sure it’s a tiny amount as noted, but I promise she didn’t taste it and I had a mom win in the books! Yay! I love this idea…so making this recipe! Thank you! Def a mom win! I love this idea! Isabella has always been a picky eater but lucky for me Gio is less so. Sounds good! Can’t wait to start making baby good again for my little guy! Yay it’s so fun to see they enjoy your creation right? The pouches are too cute! One of my favorite ways to sneak in extra veggies is to switch out regular rice for cauliflower rice. My son doesn’t even notice! Love that! I’ll try that too! That cauliflower idea ☝?️?? and those pouches are SO CUTE ? 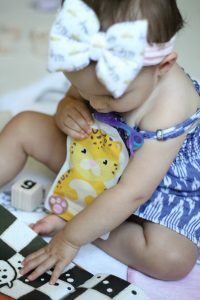 My little one is great with eating veggies, but I still would love to try out these pouches! 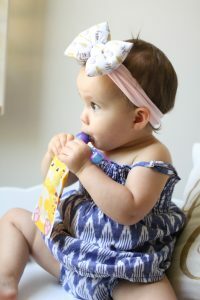 I use a few kinds that can be store bought, but I would much rather be making fresh purees for her as well as being more environmentally friendly! Yes the pouches are great. Just a month ago she started to be picky with veggies so we still offer them & I sneak them in her food so she’s actually eating them. I seriously love this! 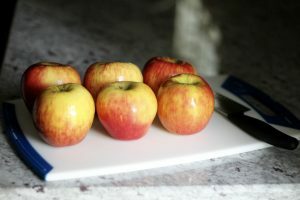 We have 12 apple trees, so I might have to make some of this applesauce in the next few months when our apples get right! This is such a good idea! My daughter loves fruit but doesn’t care for the veggies and this is a great way to incorporate them! Thank you, I ahead continue to offer the veggies on her plate, but to be sure she’s eating them, that’s how I can get it done! ?